Just as East Baton Rouge Parish School Supt. Warren Drake has promised to re-open historic Istrouma High School on Winbourne Avenue, the school’s mascot, Chief Nawaganti has been given new life. The Istrouma High Class of 1964, which donated a statue of Nawaganti to the school, retrieved the chief from the vacant building and gave him a complete makeover. 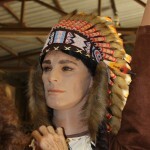 IHS grad Wayne Messina said his buckskin clothing was rotting. Now almost everything is new. The chief is now on display at the Baton Rouge Room of the Main Library on Goodwood. Istrouma High School graduates are breathing a sigh of relief as they learn that their beloved mascot, Chief Nawaganti, has been saved from destruction, restored to his former glory, and installed in a safe public place — the Baton Rouge Room of the new Main Library on Goodwood Boulevard. Istrouma was the largest high school in the state for many years. In the 1960’s, it had more than 1,900 students in grades 10 to 12. From the 1930’s to the 1960’s, it was often the state’s dominant high school football power. It produced a host of college and professional athletes, including Billy Cannon, the LSU All-American who won the Heisman Trophy in 1959. When mass busing of students began in 1970, enrollment at Istrouma and many other parish schools began to decline. So did test scores, and by 2010 Istrouma was declared a “failing school.” It was taken over by the State of Louisiana through the State Recovery District. While Istrouma was under EBR, many alumni complained the school administration was not properly protecting the school’s nine state championship trophies and countless other trophies, photos, and mementoes. After the state took over Istrouma, a custodian at the school called an alumnus to report treasured trophies thrown away in a dumpster. Some alumni discovered a room with water on the floor where boxes of mementos were being left to disintegrate. When the State of Louisiana closed the school in May 2014, Istrouma alumni expressed concern to school officials that the school’s mascot, Chief Nawaganti, and school trophies would be stolen or vandalized. With permission of state and parish school board officials, alumnus Wayne Messina, then director of security for the East Baton Rouge school system, intervened and rescued many items.